Disclaimer: I received a Beau & Belle Littles swim diaper free of charge. All opinions are entirely my own. Why had I never thought of this? How, in all of my careful, methodical planning of how to save the world by using and re-using cloth diapers, had I never thought about re-usable swim diapers?! I was a month away from delivery and OH THE HORROR I didn’t have a swim diaper. I have type A tendencies. Can you tell? When my extraordinarily patient husband came home for lunch I explained the severity of this oversight. God bless that man. He reminded me that we live in the desert and where the heck would we go swimming with a newborn anyway? So anyway, my favorite thing about re-usable swim diapers is that even families who don’t cloth diaper can (and do) use them. 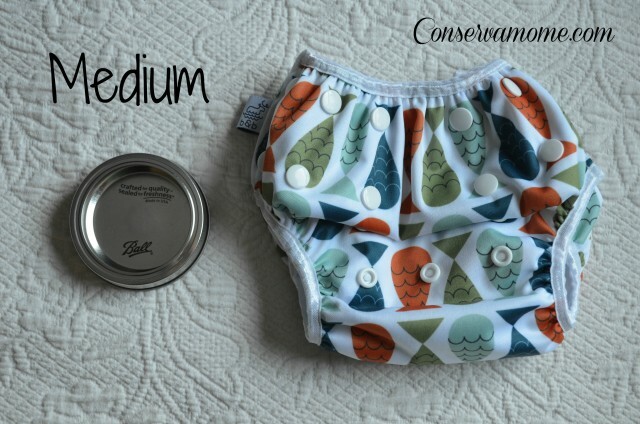 The whole point of a swim diaper, cloth or otherwise, is to keep the solids in. Obviously you don’t want absorbency in a swim diaper so don’t worry about urine. Swim diapers are all about containment because no mom wants to be responsible for the kid who shuts down the pool for sanitation. 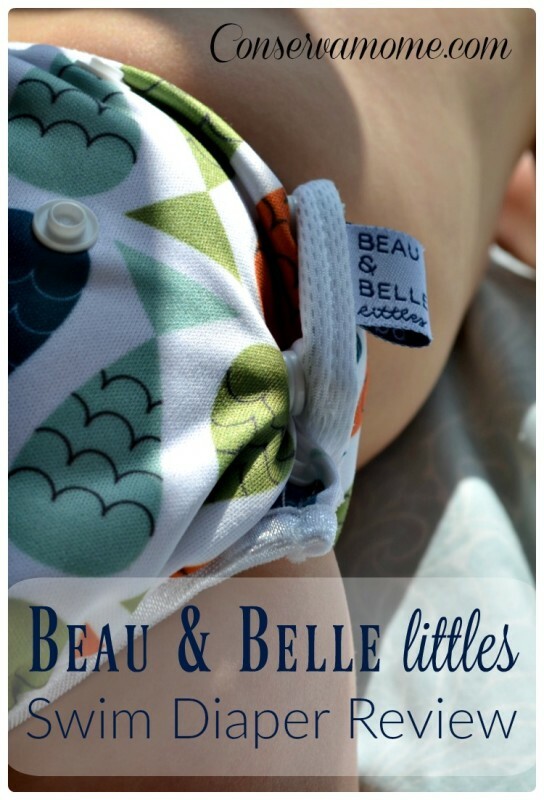 Summer is right around the corner and Beau & Belle Littles swim diapers are an adorable, USA owned but responsibly made in China. They are currently sustainable option. I have seen it said on cloth diaper discussion forums that you can use a pocket diaper with no insert as a swim diaper. That very well may work for some children but not for mine. I put an insert-less pocket diaper on my 21lb 11 month old and even on the smallest rise setting I couldn’t get the leg holes tight enough. 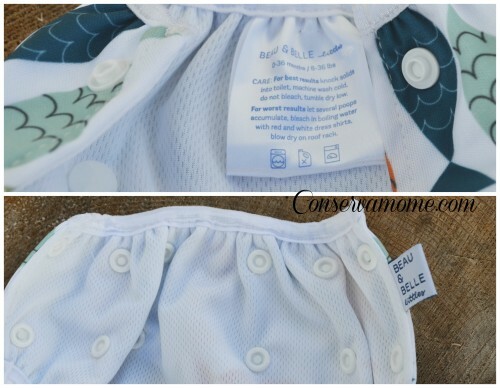 Beau & Belle Littles swim diapers are designed to fit perfectly in the legs with no inserts making this a most excellent swim diaper for all children but especially for smaller babies like mine. There are three rise settings and three waist settings. I used the standard sized mason jar lid in the pictures below for scale. This Beau & Belle Littles swim diaper is designed for children 0-36 months and 8-36lbs. The elastic is firm and even after an hour and a half I didn’t see any red-marks. The inside is lined with an athletic style mesh lining. It is a side-snapping diaper and while I have strongly disliked side-snaps in AIO and pocket diapers I LOVE it for this swim diaper. If your baby is on the smaller waist settings there are snaps to keep the extra material anchored and out of the way. Smart. When we got this diaper in the mail the owners of the company had included a very sweet handwritten card. I love that kind of personal touch. If you have a few minutes you should definitely check out Beau & Belle Littles website. It is beautifully designed and very informative. I love that this is a family owned and operated business located in Colorado. They are a young company (founded in 2015) and are growing quickly. 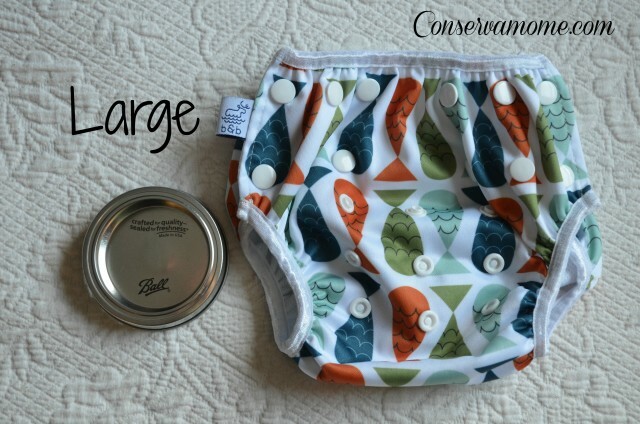 Beau & Belle Littles swim diapers retail under $20 and you can purchase one for your little fish here. And if you are pregnant and type A and just now learning about re-usable swim diapers calm yourself down and order one of these. 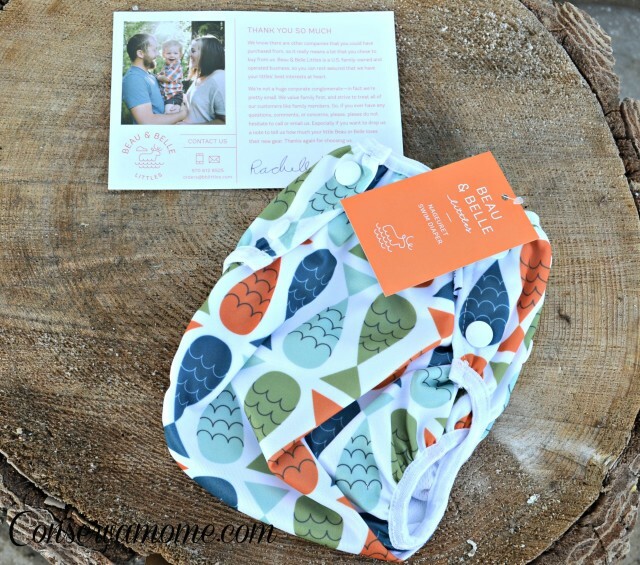 The wonderful people at Beau & Belle have extended a wonderful Coupon offer until the end of March for all my readers so you can get one of their gorgeous Swim Diapers. Just use code Conservamom30 for 30% off your purchase at Beau & Belle Littles Website. Now for the Best Part! 3 Lucky winners will each have a chance to win one of these fantastic Swim Diapers. To enter just head below and enter the giveaway tools. Giveaway is open to US only and ends on 3/19 at 11:59pm EST. Must be 18+ to enter. Good luck! I want to win this for my friend. I want to win this for my daughter in law. I want to win this for my daughter who is 15 months today! We didn’t start CD until mid summer and were very part time to start so reusable swims didn’t even occur to me. Thinking about this coming summer, I definitely want to get some cloth swim diapers! I want to win this for my daughter for her first beach trip this year! I would like to win this for my 20 month old daughter. I want to win this for my grandson who is due April 15. I would love this for my little boy! would be great for this summer. he will be one-so this would be handy. I would love to win this for my son who will be 1 on the 29th. Looking forward to his first trip to the beach soon too! I want to win this for my 4-month old baby girl! I would love to win this this for my little guy. He’s 13 months old and I can’t wait to take him swimming at the lake and pool this summer. I would love to win this for my new baby coming in 5 weeks!! I would love to win this awesome giveaway for my 11 month old son! My new little girl! We live 40 minutes from the beach and plan to be there a lot this summer week my older kids! I would love to win this for my daughter to use for my baby grandson. I’d like to win this to add to our stash! I have 5 boys and a 6th baby on the way, would like to win to put it to good use! We have a Lil’ one due this May!! 🙂 would Love to win this! I would love to win this for my 6 week old daughter, Annabelle. We live in Florida, so swimming is second nature for us! I want it for my best friend that just had a baby. I want to win for my cousin. I’d love to win this for my littlest one! So super cute! My twins will look so handsome in these!!! 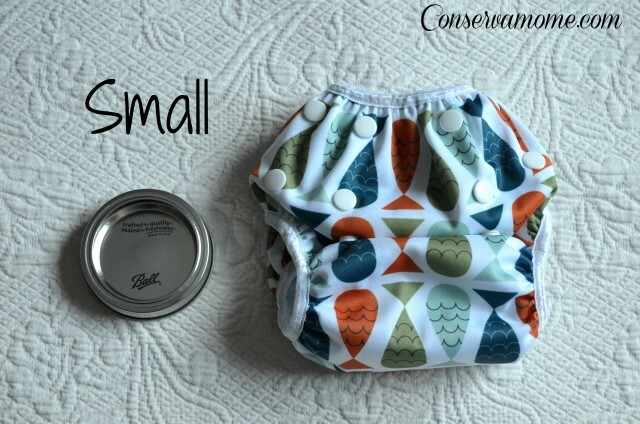 This swim diaper is so adorable! I would want to win it for my water loving 4 month old as he enters his first spring and summer in Texas! I’d love to win for my youngest until the next little one comes along and needs it! I would love to win this for my grandson. I am excited to see how these swim diapers work because they didn’t have them when I raised my children. I would love to win this to use on my daughter! She loves water and loves going to the beach, pool, or splash pad! We have always used cloth swim diapers on her, but we need a new one, so it would be awesome to win! I would love to win this diaper for my son. This diaper is adorable! Thanks so much for the giveaway! I want to win this for my new squish who was just born in February. We cloth diaper but I don’t have a swim diaper for him yet. And we have a pool! Thanks! I have seen the ring slings but haven’t tried them. It would be great for having the baby close in and around the pool but I’m still confused about how to get out of my wet swim suit. Since he still fits in a bucket carseat I have been taking that into the locker room and putting him in there when he’s dry and I am changing but pretty soon that won’t be an option. What to do!? Would love to win for my 12 month old son. He LOVES to swim at the beach and the community pool. I would like this for my grandson who is a toddler and will be spending time at the beach this summer. Would love to win this for my 6 month old daughter who’s gearing up for her first round of swim lessons soon. I’d love to win this for my LO! I’d love to win this for my 8 month old son. I would love to win this for my 4 month old grandson!